Ringling Bros. and Barnum & Bailey® Presents LEGENDS unveils the unbelievable to Children Of All Ages. Legendary circus artists from around the globe perform awe-inspiring feats of daring, spectacles of strength and thrills of wonder. Join us for an unforgettable family night of legendary proportions at Ringling Bros. and Barnum & Bailey® Presents LEGENDS at the Amway Center from January 14-18, 2016. Ringmaster Johnathan Lee Iverson guides Paulo the Legend Seeker on a quest to discover real, living legends from around the world. Audiences will experience Alexander Lacey and his enduring bond with his lions, majestic leopard and tigers during one of the most captivating acts. The Solar Hawks, a dream team of acrobats, come together to amaze by attempting four consecutive triple somersaults on a one-of-a-kind double-wide trapeze specifically designed for The Greatest Show On Earth®. The Riders of the Wind, Cossack trick-riders will thrill as they thunder into the arena on the backs of thoroughbred horses stealing your breath with their daring stunts. Experience and learn about the special relationship between trainers and treasured Ringling Bros.® Asian Elephants as each trainer shows off individual elephant’s natural skills and abilities. We had a fantastic time when the circus came to town last year, and the look in my little man’s eyes when he saw all the legendary acts perform was priceless! I cannot wait until we can experience it together again as a family. For a limited time, I have an incredible offer to share with you! You can save $4 off tickets using promo code: 4MOM. Offer valid on all shows EXCEPT Thursday at 7:30 p.m. (opening night), Saturday at 3:30 p.m. and Sunday at 1 p.m. Not valid on Front Row and Premium Seating, nor day of show. Offer valid through January 14. Tickets for Ringling Bros. and Barnum & Bailey Presents LEGENDS start at $16. Tickets are available at www.Ringling.com or www.ticketmaster.com, at any Ticketmaster outlet, by calling 800-745-3000, or at the Amway Center box office (phone: 407-440-7900). For group ticket sales and information, call 866-248-8740. The Amway Center is located at 400 West Church Street – Suite 200, Orlando, Florida 32801. 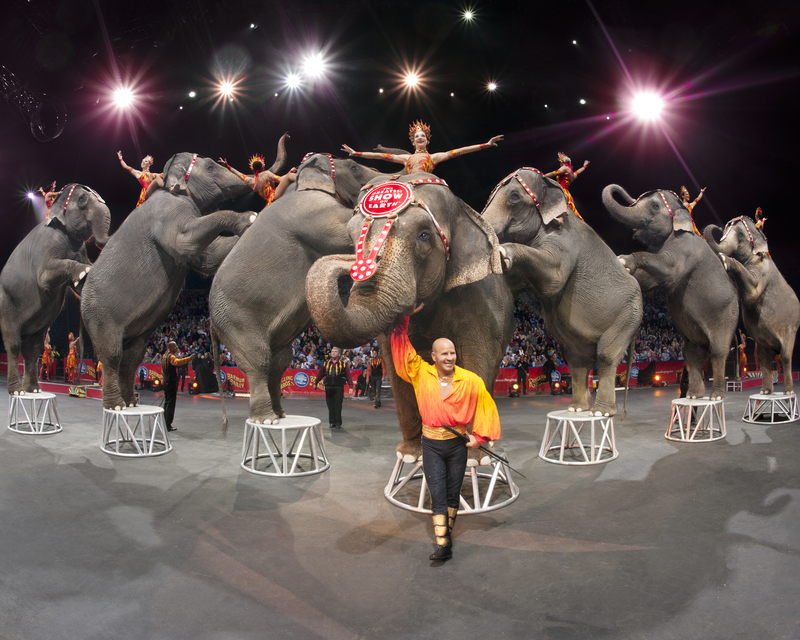 Free to all ticketholders, the All Access Pre-show meet the performers of The Greatest Show On Earth, get autographs, take photos and enter to win a one-of-a-kind pachyderm painting. Ticketholders can purchase an upgrade and go backstage with a VIP Behind the Scenes Tour of Ringling Bros. and Barnum & Bailey. The backstage experience includes an insider look at props and wardrobe, an up close and personal encounter with the animals and a chance to meet stars from the show. Fans will also have an opportunity to take pictures and learn educational fun facts. To take advantage of this once-in-a-lifetime experience, just log on to ringlingbros.expapp.com from your iPhone or Android smartphone, and provide your name, e-mail and phone number to become a VIP circus insider. For more information visit Ringling.com. If you are local, you should definitely take advantage of this fantastic promo deal for $4 off tickets with promo code: 4MOM. We hope to see you at Ringling Bros. and Barnum & Bailey Presents LEGENDS when it comes to the Amway Center January 14th through 18th. Definitely not a show to miss! Hold onto your seats, friends, and prepare to be blown away because Ringling Bros. and Barnum & Bailey® Presents CIRCUS XTREME is coming to the Amway Center for seven shows January 8th through 11th!!! For a limited time, there is an AMAZING offer to save ‘XTREME!’ with 40% off tickets using promo code PRESENT. Offer valid only for Friday 7:30 p.m., and Saturday 11:30 a.m. and 7:30 p.m. performances. Code only valid December 8-24. Not valid on Front Row and Premium seats. Not valid day of show. Excludes opening night performance on Thursday, January 8. Purchase tickets and view show times at http://www.ringling.com or www.ticketmaster.com, at any Ticketmaster outlet, by calling 800-745-3000, or at the Amway Center box office (phone: 407-440-7900). exhilarating adventure with extraordinary circus artists and exotic animals. seekers, Alex and Irina Emelin. leaping through a 15-foot transparent tower – and this is just one act! How cool will it be to see all the animals, the performers, and let’s not forget those clowns, right?!?! What’s the circus without clowns? Haha! I can’t wait to see little man’s reaction and, I am not going to lie, I am super excited, myself. It’s been years since I have been to the circus, so this will be a real treat. If you are local, you should definitely take advantage of this fantastic promo deal for 40% off tickets. We hope to see you at Ringling Bros. and Barnum & Bailey® Presents CIRCUS XTREME when it comes to the Amway Center January 8th through 11th. Definitely not a show to miss!